Never thought I'd start photographing birds. 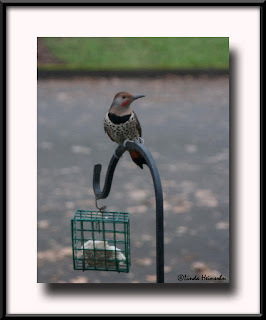 However, Hubby has been putting feeders of various types outside our dining room window. The cats started watching (and residing on the dining table) immediately. On Father's Day, our kids got us a couple of charts illustrating various local birds. Then, I put my old camera nearby to catch the quick flyers to give us something to look at to identify the birds. As you can see—a slippery slope has started. These flickers have captured my imagination, though. They stay year 'round here in Portland and will nest in our yard if we provide a house for them. When they fly, their entire under wing is crimson! Shot through the window screening on a cloudy day with my old Canon Rebel XT. Post in Photoshop Elements 9.